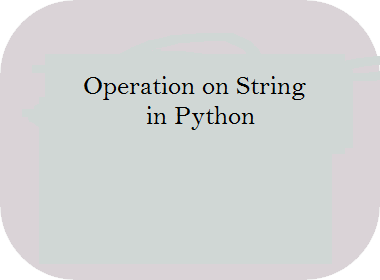 In this article, we will learn how to perform operation on string in Python with example. It is the continuation seventh article of "Zero To Hero In Python" series. Everything we will understand step by step. Before read this article go through my previous articles. String: Strings in an array of bytes which represent Unicode characters in python. Python does not support character datatype. A single character is also work as string. Python support to write string within single quote and double quote. DoubleQuotes ="Python in Double Quotes"
In the above code string values assign within variable using single and double quotes. String can be output to screen, using the print function(print()). can be used to access elements of the string. 1. Indexing in String: it is return particular character from given string. If I want to fetch 7th index character from given above string. Python provide the facility to positive with negative indexing also. In above code python allow us to get get particular character using positive and negative indexing. you can see in our positive index code index 3 contains H and our output is also H.
Now you can see in above code negative index of PYTHON, N (-1), O (-2), H (-3), T (-4), Y (-5), P (-6). When we will call Text(-4) then it will print which you can it in output. 2. Substring: Get substring from given string use indexing with colon. Some functions which is used with string in function. They are given below. 3. Strip(): This function is used to remove white spaces from given string. message =" Welcome Python. " 4. lower(): This function is used for return string in lower case. 5. upper(): This function is used for return string in upper case. 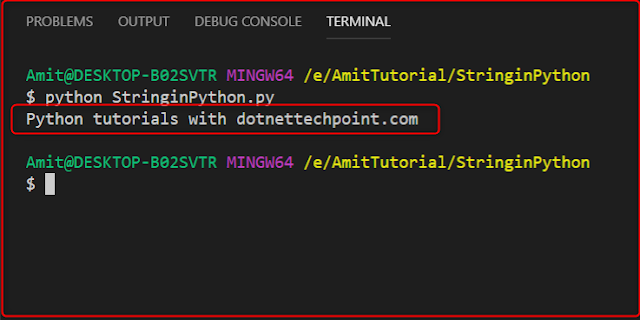 message ="Python tutorial with dotnettechpoint.com"
6. len(): This function returns the length of given string. 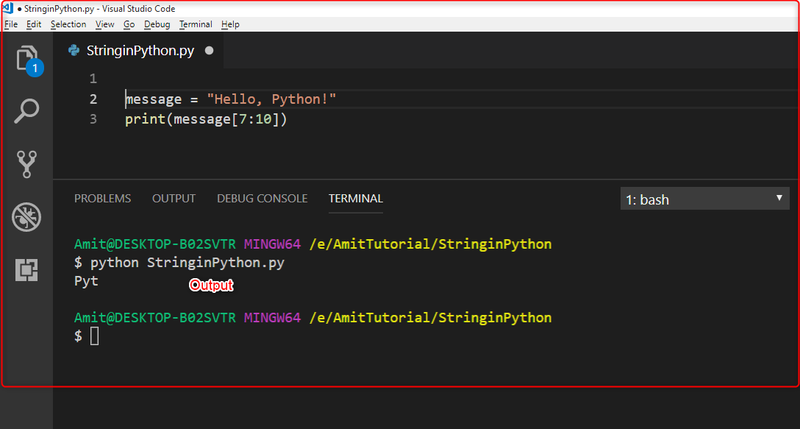 7. replace(): This function is used to replace a string with another string. message ="Python, tutorials, with, dotnettechpoint.com"
9. title(): This function returns fist letter of each word in upper case. message ="python tutorials with dotnettechpoint.com"
10. capitalize(): This function is used for covert first character in upper case. 11. Count (): This function returns occurrence of subsisting in a string. 12. Find(): This function returns which index your search text is available in given string. 1. If find() function returns -1 then search text is not found. 2. The find() method is same as the index() method, the only difference is that the index() method raises an exception if the value is not found. 13. Join():This function append particular things in given all items. 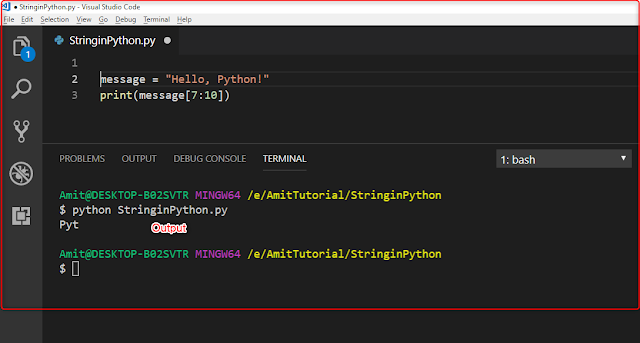 Concatenation of strings: We can concatenate two or more than two string in python using + operator but we can not concatenate string with another datatype, when we will try to concatenate then it, It throw an error. In the above output error clearly mentioned that concatenate only string not int, now what is the solution of this problem we can solve this problem to convert int into string or pass middle_string as string and then concatenate it. Try to both way.